This time last year I was in the thick of it putting the recipes together for Made in America. Every day I would return from dropping the children at school with bags and bags of ingredients ready for more recipe testing and photography. I would then tackle recipe upon recipe – slowly getting each one into a format that any home cook could make up successfully, before getting the dish ready for its close up. The insane schedule meant that there was very little time for anything else – even entertaining my sister when she came to stay for a week. However, there was time for eating all the many new dishes I was learning to prepare and one of the most successful were the Rock Star Sandwiches from Marc Vetri. I baked up a batch of bialys and all the various fillings and let everyone mix and match so they got exactly the sandwich they wanted. Vetri wanted to make an old school Reuben sandwich with a distinctly Italian twist – using mortadella instead of the traditional pastrami – and on a homemade bialy – a Yiddish roll a bit like a bagel (baked rather than boiled). 1. In an electric stand mixer with hook attachment mix flour, salt, yeast and warm water. Knead for ten minutes on low speed, adding additional water/flour if needed to form a soft smooth dough. 2. Cover and proof for 1 hour in a warm place. 3. Cook onion for 30 minutes, over low heat, in 1 tablespoon of olive oil and set aside. 4. Weigh out 3 ounce balls (13 total) and let rest for 30 minutes. 5. Heat oven to 450 degrees F.
6. 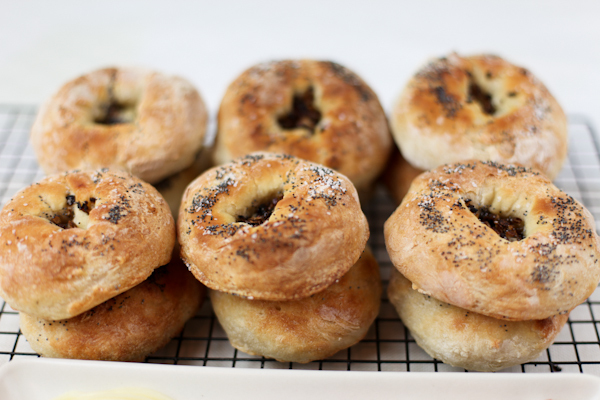 Shape bialy into rounds with an indention. Fill with onion and then sprinkle with poppy seeds and sea salt. Place on oiled sheet pan top and bake for 12 minutes until golden brown. 1. Place roasted peppers and bread crumbs in blender and blend until smooth. Slowly drizzle olive oil in to emulsify. 2. 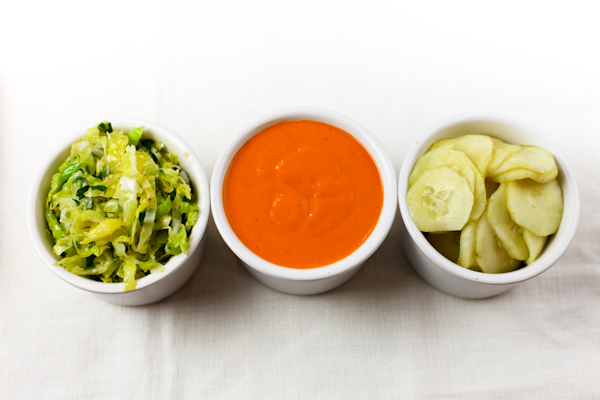 Mix salsa rossa with mayonnaise, add more mayonnaise to taste. 3. Season with sherry vinegar, salt and pepper. 1. Bring everything up to a boil except the cucumbers. 2. Pour boiling liquid over cucumbers and let sit for 1 hour. Set aside in the refrigerator. 1. Marinate all ingredients for an hour. 1. 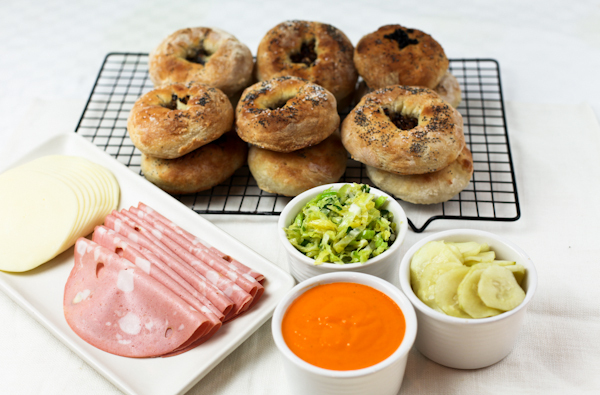 Slice the bialy in half and inside place the salsa rossa, slaw, pecorino cheese and mortadella. 2. In an iron skillet on medium heat melt butter, place the bialy in the pan and press with another pan or a brick. Flip after about 3 minutes and cook another 5 minutes until the cheese is melted and the crust is golden brown. 3. Slice and serve with the spicy pickles on the side. « Fluffy Bunnies, Lamingtons and Happy Birthday Letty! 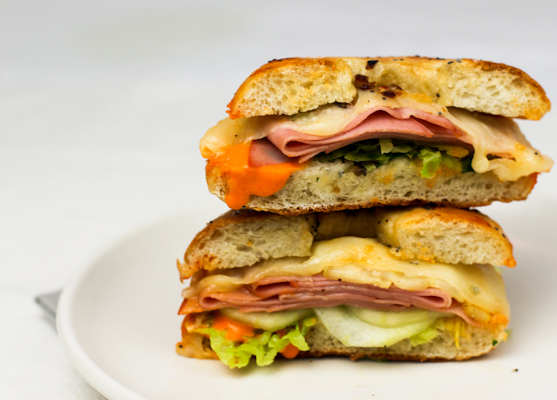 This sandwich looks heavenly! If only I were eating grain right now. 🙂 As a substitute, I’ll have to try the sandwich fillings together as a salad. This is my dream sandwich! I think I’m drooling. I want to be a rock star ~ do you think this bialy sandwich with help get me there?? Love. You r a rock chick ! there is truly nothing better than a good bialy! looks yummy! I would love to bite into this sandwich!